- After a lengthy introductory sequence you'll wind up in what appears to be a throne room, and you'll gain a metric buttload of new quests / collections / Codex entries. Once they're done - assuming you want to have the slightest idea what stuff needs to be done in the near-to-distant future - you can set about exploring your new base. Woot. Start by checking out the Fast Travel stone by the throne. - Check the door to the right of the throne that sits before you. This leads to the Undercroft, and if you look to your right upon entering you can find a small reading on the purpose of this area. Harritt has set up shop down here as the smithy, and you can use it to perform the usual set of tasks. You can also use the desk in the rear of the Undercroft to aesthetically customize your version of Skyhold to your liking, though many of the options will not be available to you from the start. Once you have access to the War Room you can complete the Acquire the Arcanist operation, which will bring an Arcanist (Dagna) to Skyhold and allow you to enchant items. - Head back to the throne room and wander west. There's a door on your left that leads to a circular room. Solas lingers in here. Speak to him and he'll give you the quest Measuring the Veil, over in the Hinterlands. In the rear of this room you'll find stairs leading to an upper floor library, where you'll find Dorian. If you received a warning from him that Haven was under attack (namely because you sided with the Templars) you can speak to him now and either welcome him to the Inquisition or give him the boot. - Keep looking around the library and you can find the Folly of General Not-Sheritan Codex entry / update on the shelves. Also here is a Tranquil named Helisma, who takes over for Minaeve when turning in Research. - There's another set of stairs in the library leading upward. You'll find Leliana's new station at the top, as well as another Fast Travel stone. There's a decent bit of reading material up here, including the A Fine Time to Close a Border Codex entry. - Go back to the throne room and check the right side for another door. Through here you'll find Josephine's office, and past her office is the War Room. Much fancier than before. - Return to the throne room and head outside, to the courtyard. Vivienne is down here for conversations, and Sera stands a short distance away beside a shelter. Blackwell is on the other side of the stairs. All three have conversations for you now that you have a new home. Vivienne likes her opinion validated; Sera enjoys skepticism; Blackwell likes an honest approach. You can also find Harding here, at the base of stairs leading up to the ramparts. - Speaking of the ramparts, if you climb the stairs near Harding you'll wind up atop the walls. Varric is up here, through a ruined tower and near stairs back down to the ground, and speaking to him will introduce you to - surprise! - Hawke, from Dragon Age II. - Follow the path along the ground to its end and you'll find Iron Bull and Cassandra. Both will offer you opportunities to get to know them better. Between them is another Fast Travel stone you should activate. - Run back to the stairs that lead up to the throne room. You'll find a passage beneath them (and a note beside the passage, if you care to read) that leads to a lower courtyard. Check a spot that says Look for Cole to trigger a cut scene between multiple party members. You can use this conversation to keep him around or give him the boot, whether you accepted him earlier or not. You can also talk to Cullen down here. - That's all for Skyhold at the moment. You'll get to explore this place more in the future as it's slowly rebuilt. For now, you have two choices: either pursue the quest introduced by Hawke, Here Lies the Abyss, or pursue the quest introduced by Josephine, Wicked Eyes and Wicked Hearts. The first costs eight Power; the second costs thirty Power. You can guess which one we'll go after first, no doubt. Skyhold gets progressively nicer looking as the game wears on. After you've left it and returned for the first time, huge sections of the place will be repaired. We'll have a quick look at these before doing anything else. Skyhold won't be fully repaired until after you complete another quest along the Inquisitor's Path. - The main courtyard now has a nice tavern, right beside Harding. Pop inside and you'll find a bard who will offer a large number of songs for the Patron of the Arts collection. Beside her is the Take Back the Sky: A Tavern Cheer song, speaking of which. The place is run by Cabot, though he's... not much help. Near Cabot is a posting of tavern news; check it often, as it changes. You'll find the Iron Bull on the bottom floor, and on the second you'll find Sera. Outside Sera's room is a diary that changes periodically, and is also worth checking when you're in the area. Cole lingers on the top floor. 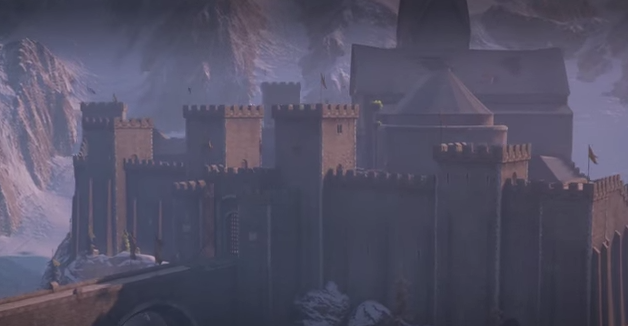 - Now that Skyhold has been repaired, the battlements will be fully accessible. Climb onto them near Harding (or via the third floor of the tavern) and you'll find one room that was previously flooded with debris. Look inside for the Hard in Hightown: Chapter Five Codex entry. - ... but if you travel north along them you can find stairs leading down to a new courtyard. Here you'll find Mother Giselle, who has a fair amount to say about the game's backstory. Also here is the new apothecary of Skyhold, and not far from her you'll find a Nursery for planting seeds. These will grow into full herbs over time. Check along the edges of the courtyard for a small room of worship, as well as a hilarious letter on one of the benches. - A door off the courtyard leads back to the main hall of Skyhold. Varric has relocated here. Near him is another dwarf named Gatsi, who will analyze mosaics you find on your journeys. The throne has a new feature, but we'll leave that for now. Climb the stairs through a door on the right side of the hall (assuming you're coming in from the main entrance) and you'll find Vivienne hanging out on the second floor. The main hall's two floors have several notes, affixed to the construction scaffolds, and you can read them for experience. - Leave the Main Hall and descend to the main gate of Skyhold. On your left you'll find a new courtyard has opened up. Blackwall lives in a barn out here, and he'll give you the Memories of the Grey quest. The barn is connected to Skyhold's new stable. Nearby sits a Fast Travel stone for easy (er) access. Across from all this, by a stall, is a lady named Bonny Sims who has set up a weapons shop. Upon returning you'll also be given two new quests, Sit in Judgment and Specializations for the Inquisitor. Both are fairly important, so we'll address them below. Once the main hall / throne room is up and running again, you can sit in the Inquisitor's throne and judge people who have been found guilty of some crime or another. Depending on your Inquisitor's decision the person may be pardoned, put to work on behalf of the Inquisition, jailed, or even killed. Many of the villains you face (and defeat) throughout the game will wind up here; your judgment will seal their fate. Don't be too quick to kill someone, though, as they may serve well as an Agent instead. Check out the War Table. You'll find an Operation in northwest Ferelden called Specializations for the Inquisitor. Embark upon it with Josephine and you'll call three specialists to Skyhold. Their occupations will depend on your Inquisitor's starting class, and you can choose one of the three as a tutor for your Inquisitor. Meet them in the courtyard nearest the front gate and they'll provide you with quests. You can take all three quests - doing so completes Specializations for the Inquisitor itself - but you can only turn in the required items for one of them. The chances are very slim that you'll have the items you need to do these quests right now, so you'll have to come back to this once you've explored more areas and found rare, exotic items that will appease your tutors. Bear in mind that you do not have to take up a specialization. It's hardly a requirement for beating the game. Doing so will unlock new ability trees that other characters can't touch, however, and may allow you to do things that you couldn't otherwise.